With a concept from farm to plate Grace Road Group Limited has opened its fourth outlet at TappooCity food court. The company which owns a growing chain of restaurants and cafes continues to increase their investments in Fiji’s food industry. 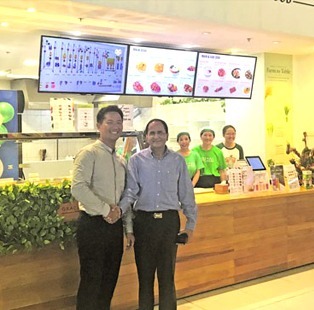 Trading as Grace Road Kitchen, it adds to the existing successful sister outlets in TappooCity Food court- Pacific Patisserie, Pure Green and Noodle Story. Tappoo Group executive director Mahendra Tappoo said: “It’s obviously the success of their outlets that they have decided to open their fourth outlet. Group managing director Daniel Kim said: “For us it’s about from farm to plate, this is so we can supply the customer with organic food. “We thank Tappoo for giving us space to operate our outlets because we complement each other. He said in the future, he hopes to open an outlet at Tappoo Sigatoka and would discuss it further with Mr Tappoo. The chicken and mixed Asian food are reasonably price.